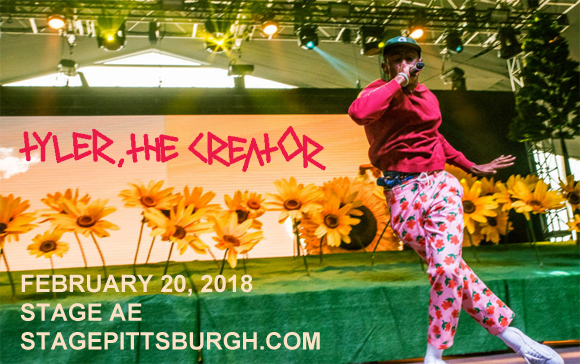 Rapper, producer, video director and "Flower Boy" Tyler, The Creator is heading to Stage AE on Tuesday 20th February 2018! After building a huge buzz around his new release, Tyler hits the road and, in a colorful and exciting show, will be performing tracks from his smash hit new album! Tyler will be joined for the evening by Californian hip-hop artist Vince Staples! American rapper, record producer, and music video director Tyler the Creator first began his career as leader and co-founder of the hip-hop collective Odd Futures, formed in 2006, alongside Left Brain, Hodgy Beats and Jasper Dolphin. His debut album, Goblin, was released with XL Recordings in 2011 and entered at number five on the Billboard 200 chart. The album launched the single “Yonkers”, which is considered Tyler's breakthrough hit, and the video for the track won the MTV Video Music Award for Best New Artist at the 2011 MTV Video Music Awards. After signing a joint record deal for him and his label Odd Future Records, with RED Distribution and Sony Music Entertainment, Tyler released his second studio album, Wolf, which debuted at number three on the Billboard 200 and sold 90,000 copies in its first week. His fourth, and most recent album, Flower Boy was released in July 2017.